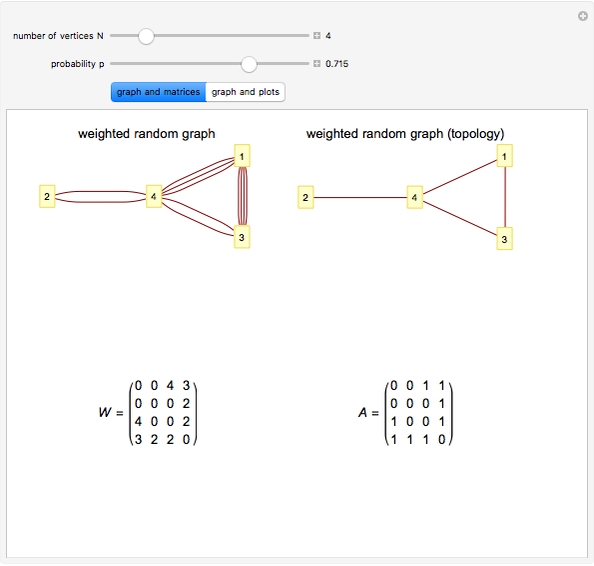 The weighted random graph (WRG) model is presented here. 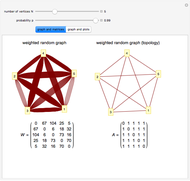 A WRG is generated: the probability that a weight (i.e., a number of links) is present between any pair of vertices is . The adjacency matrix (the binary matrix where means that vertices and are connected) and the weighted adjacency matrix (where means that links are present between vertices and ) are shown. is the cumulative weight distribution, is the cumulative degree distribution (where ), and is the cumulative strength distribution (where ); the corresponding lines are red, green, and orange, respectively. This Demonstration implements the WRG model as a function of the number of vertices and the parameter controlling the average weight. In this Demonstration only graphs with a small number of vertices can be generated. 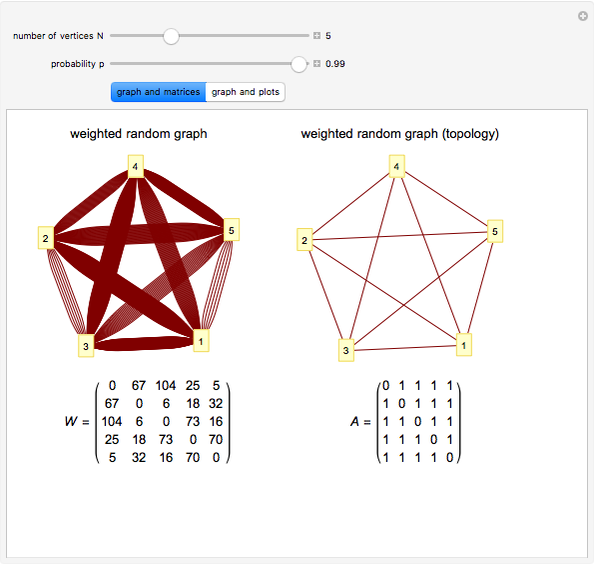 A larger number of vertices would make the graph an indistinguishable ensemble of lines. 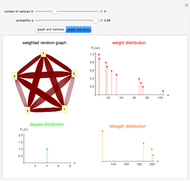 Besides the visualization of the graph, the fundamental topological properties are shown: the observed cumulative weight distribution (in red), the observed cumulative degree distribution (in green), and the observed cumulative strength distribution (in orange). The theoretical curves predicted by the weighted random graph model would be a cumulative geometric distribution with parameter , a cumulative binomial distribution with parameters and a cumulative negative binomial distribution with parameters , respectively. As can be seen, for small values of the strength distribution is almost indistinguishable from the degree distribution, while as increases the two quantities become increasingly different. 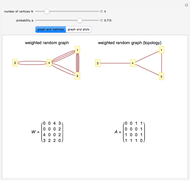 "The Weighted Random Graph Model," Diego Garlaschelli, arXiv:0902.0897v1. 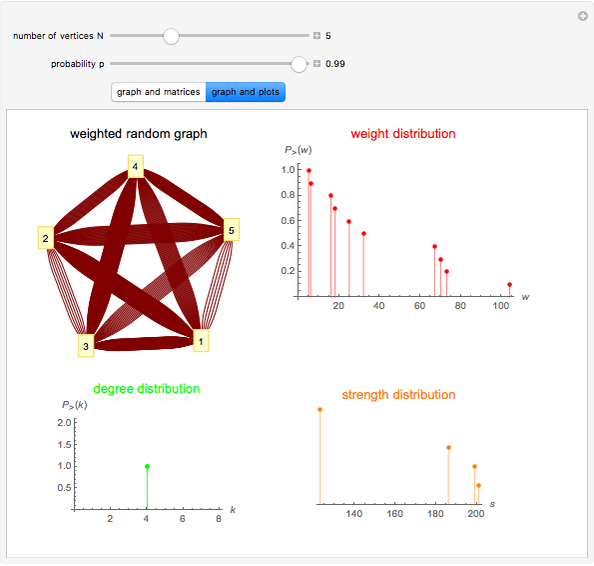 Tiziano Squartini "Weighted Random Graph"